I know it can feel like there is always something better "out there" — a shinier program, a better system. I've been known to get dozens of free trials, read all the comparisons, and still hit cancel on all of them just because it's impossibly overwhelming! So if that's you, I totally get it. It can take some hunting and some grueling work to feel settled and confident in your systems, but just remember: It's all with the goal of less stress, a more incredible client experience, and greater freedom. 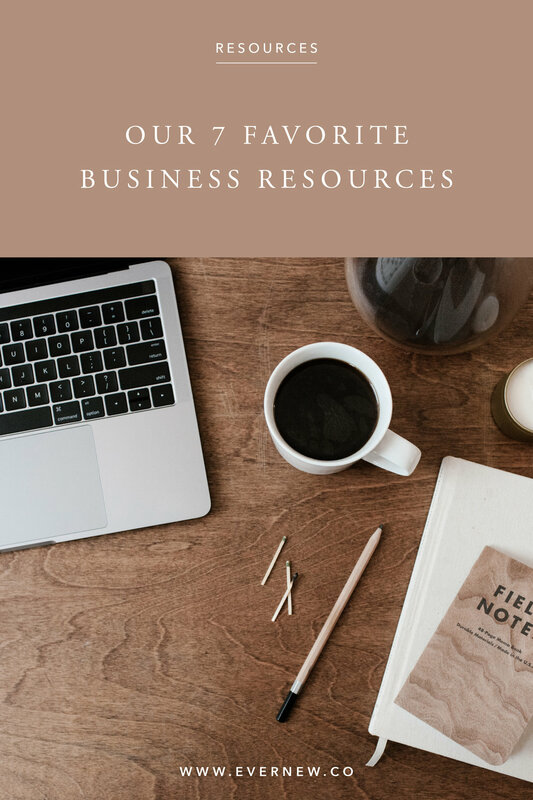 To help you out, if you're in that hunting phase or are just curious to hear what we use, we wanted to offer you the 7 most valuable resources for our business! This is especially a must if you are a sole proprietor or don't currently have your business transactions separate from your personal. But I still use it even as an LLC with separate finances. Their app just makes it SO easy to track mileage, how much I owe for quarterly taxes, and records of my expenses and income. I may end up switching in the future only because Quickbooks Online syncs with more of the programs I use, which would save me some steps. QB Self-employed just doesn't haven't all the reporting and tracking capabilities that QB Online has — which doesn't affect me now, but if I outsource to an accountant, it would prove valuable at that point. Just some bonus thoughts! Can't recommend this book enough! It is causing me to totally rethink Evernew's finances and pricing. They even have a network of accountants, bookkeepers, and coaches to help you implement the Profit First System. Mike's writing is fun and engaging and the book is completely practical and hands on. Best $16 investment! Sure, Mailchimp is a more affordable way to get started in email marketing, but I quickly fell in love with how easy it was to segment groups and how simple and personal ConvertKit's formatting was. It keeps my emails from getting lost in Gmail's "Promos" folder! Don't see myself switching anytime soon! This is one of those categories that I've bounced around in for a long time, trying out 17Hats, Harvest, and Honeybook. I actually had landed on Honeybook and had been using it for about a year, when I decided to revisit Dubsado. Immediately, I knew it'd be a better fit for me. I'd be happy to share more about the reasons for switching, but in summary: Dubsado's customer service is through the roof. Dubsado allows for much more customization (which does mean it takes longer to get setup – Honeybook is much more drag and drop into their premade templates, including styled emails). Their client portals and task boards are much more usable and dynamic than Honeybook's. Aaaand Dubsado costs almost half as much per year. I did recently discover Dubsado's task boards which work similar to Asana or Trello, so I have migrated some of my planning and lists over to that platform. Honestly, I've always used "Notes" on my phone or computer to throw information and ideas, but it's started getting messy. So I'm trying to throw more into Dubsado and Google Drive and rely less on other programs. I use UNUM for laying out my instagram images, prepping captions, and scheduling content. I've tried out some others, but loved the simplicity and aesthetics of UNUM. And it's free! I'm the first to admit that all the courses and webinars offered these days are overwhelming. But this was one training program I was so glad I jumped on! They only open their course on occasion, but definitely visit their site and download their 7 free tools pdf. They'll also send you a video series that gives a great summary/preview of their course! Do the work of applying their free content and you'll be well on your way! There you have it! 7 of my absolute favorite business tools. Honestly, it was hard to narrow down, but I decided to focus in on the ones I use on a daily basis. For a more complete list of resources (including favorite business books and photography gear) check out the "Resources" button at the bottom of the site! If you have any questions regarding one or more of these – comment below or shoot me an email at hello@evernew.co. I'd love to talk more! Note: Some of these links are affiliate links and I receive compensation when you use them. However, I only share these resources because I actually use and love them!